This is a trail on the western slopes of the Catalina Mountains below Samaniego Ridge. Most of these trails in this area are used as mountain bike trails but do see some hikers, especially as you get higher up on the slopes of Samaniego Ridge. There is a maze of trails in this area many of them are not official named routes. Signage in this area is nonexistent. This trail is entirely on National Forest but access is from State Trust land and a State Trust Land Permit may be required. I was informed by the locals that hiking in the area didn’t require a permit but parking on state Trust Land probably does. The rules for State Trust Land require that you get a permit if entering Trust Land. I went on line and got a year pass for $15.00 to be on the safe side. The Majority of the trails in this area are on National Forest but the Trail Heads are on Trust Land. Accessing this trail is from the Golder Ranch Road Trail Head via the Middle Gate Trail or this trail can be accessed from the north end via the Charouleau Gap Road which is on National forest land. The Charouleau gap road is a rough 4WD road and in places not sure I would call it a road even for high clearance 4WD. This description is from the south end of the trail where it intersects the Middle gate Trail. There are actually two trails that come off the Middle Gate Trail for the Cherry Tank Trail, The one to the south is about midway on the Middle Gate trail, at its crest and is the best route if coming in from the south. The route for this description is for the southern most access point. If coming from the north on the Middle Gate Trail the other access point is 0.4 miles further north of the southern access trail along the Middle Gate. This access trail or spur trail connects up to the Cherry Tank Trail in 0.4 miles. 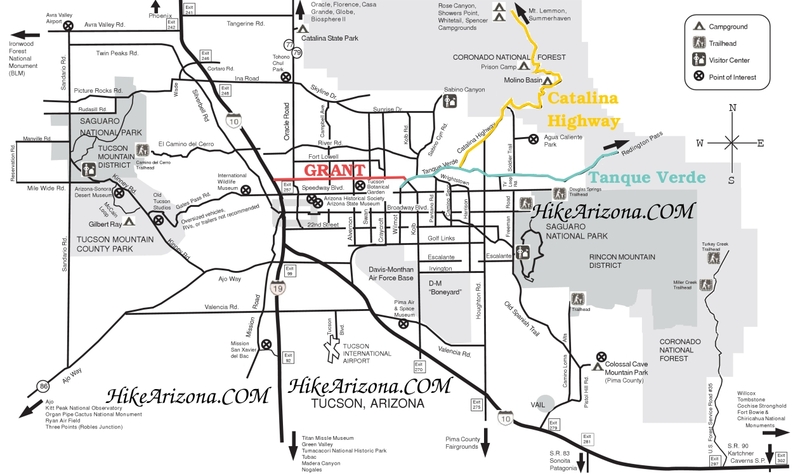 The Cherry Tank Trail starts out following a small tributary of Sutherland Wash and after 1.5 miles drops into the upper reaches of Sutherland Wash. Pusch Ridge to the south and Samaniego Peak to the East are the main views. The trail remains in or near Sutherland Wash and after 0.25 miles comes to the junction with the Cowboy Slickrock Trail. From here on the Cherry Tank Trail becomes very interesting. The Canyon becomes narrow and passes through one of the best riparian areas I have seen in this area. The hills on either side are made up of very large granite outcrops particularly to the east where they form domes much like in Yosemite (except smaller). I found myself continually gazing at them even though I was trying to watch the trail for snakes, which I saw two already. These rock domes will remain visible from the trail for the next mile or so. After an interesting 0.5 miles along the Sutherland Wash the trail heads north out of the canyon and up to a ridge where it intersects the Cherry Tank Upper Trail. The trail continues east along a ridge that separates the Sutherland Wash Drainage system from the Dodge Tank Wash Drainage system. The vegetation slowly changes to a Grass Oak Tree environment. Massive rocks are now due south of the trail. The trail gradually heads south until it comes to Cherry tank (could be Dodge Tank, not named on map). This tank had a good amount of water in it and I was surprised because we hadn’t had any rain since mid August and this was late October. From this tank the trail follows the road north to the Charouleau Gap Road. This is the northern access point to this trail but the 4WD road is in rough condition and in places I wouldn’t consider it drivable. I park my Jeep down near Canada Del Oro and walk the two miles to this trailhead. This trail is in good condition with minimal route finding skills required; just keep a watch out along the upper reaches of the trail as the grass tends to obscure the trail in places. For those interested in hiking this trail to the Charouleau Gap Road and not interested in seeing Cherry Tank and adding 1.4 miles to the trek, there is a shortcut route that bypasses the tank. At about 0.8 miles from the Charouleau Gap Road after climbing out of Dodge Tank Creek, the road comes to a crest, at this crest there is a faint trail that heads to the southeast. The route follows down a small ridge and across a wash then up the other side to connect up with the Cherry Tank Trail near the intersection with the Cherry Tank Upper Trail. This is a 0.4 mile, hone your route finding skills trail. From the road you can see your destination so there isn’t much chance of getting lost.